I'm on a quest. 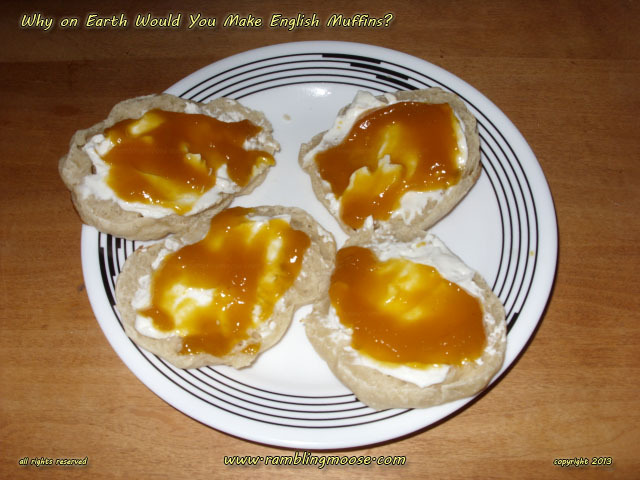 English Muffins and Crumpets. Ok, English Muffins are common, but it has always irked me that you basically spend as much as $7 for a box of 6 of these things. Usually $3 a pack, or .50 a piece. Come on, they're just bread for crying out loud. The other side of this is that I have a good friend who is a British Ex-Pat, David, who is due to come up again, if it ever happens that is. I thought it might be nice to have Crumpets around and those are even more ridiculously pricey - if you can even find them. So I found a recipe online. They are from Delia Smith, of TV fame in the UK. Once in a while her shows "leak out" to the US. If you want a proper Crumpet, why not one of the more famous British Cookery Show Hosts? First you need something called a "Crumpet Ring". The US doesn't really eat a lot of Crumpets, but there's a very common substitute. They're basically called "Egg Rings" here, and let you make a 3 3/4 inch round egg. You can even go with a cookie cutter or remove the top and bottom from a tuna tin if it were safe to eat tuna any more. Then I started reading her recipe. There were a few problems. Being a Yank, I do things in Ounces but adapt fairly well to Metric. Being someone who used to get Chemistry Labs to 99.5% of theoretical yield, I am very precise in the kitchen. But there was something that threw me. Her measurement for the flour. It was, and I quote, "8 Ounces or 225 Grams of Strong Plain Flour". I took Strong Plain Flour to be Bread Flour, and I have a 25 pound bag of that. High Gluten Flour. Good stuff, but it tends to mess with recipes. I know for a fact that I have to add more liquid to a recipe when I bake with High Gluten Flour. She MAY be using the equivalent of "All Purpose Flour" which has a lower protein percentage and a lower need for liquids, I'm not certain. The other problem is that while literally that is correct, which do you use, weight or volume? I went with By Weight the first time and the result was ... roughly correct. You can easily pack more flour into a cup than 225 grams by weight, so you might want to spoon it into a cup and weigh the lot. Or sift it. That can be solved by adding more liquid, milk is best. That brings me to the next wrinkle. This is a very basic recipe, only 5 or 6 ingredients. But it needs the yeast to proof. I missed that when I made the stuff and ended up making something that turned out sort of like a Matzoh. While I like Matzohs with Peanut Butter and Jelly as something "different" it wasn't what I wanted. The trick with Proofing your Yeast was simple - get a quart jar or a glass bowl and let the stuff sit in it. Add to the bowl a teaspoon of sugar and a half cup 4 ounces of milk plus 2 ounces of water. Warm this (I used the microwave) until it is around 110F or "Hand Hot". Since we all have different perceptions, I managed exactly 110 F by giving it two shots in the microwave at 30 seconds each. Add the one teaspoon of yeast, stir well, and allow to sit aside 15 minutes until frothy. That actually worked very well when I had made it the second time, which results are pictured here. 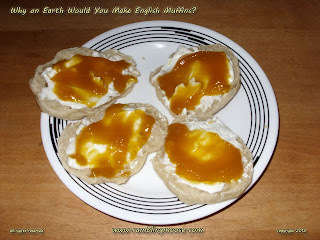 Cream Cheese and Mango Jelly on a home made Sourdough English Muffin... YUM! In a second mixing bowl, add that errant cup of Flour, 1 teaspoon of Salt, and mix them together. When the Yeast has gotten frothy, add the liquids to the Flour and Salt and mix until smooth. I used a stand mixer since I was getting frustrated, but that may be overkill. The thing is that while Our British Cousins will know what this should look like, I have yet to get the right consistency. My thought is that for an English Muffin, the recipe was too dry and I ended up adding more milk to the mix bringing it to 7 ounces total. For Crumpets, you will need a dry Pancake Batter Consistency so next time I'll start with 7 ounces and keep mixing in Milk one ounce at a time until I get this right. Allow your batter to rise for 45 minutes covered with a tea towel. For cooking, you need a greased griddle at 325F. Grease the griddle/skillet/frying pan and the Crumpet Rings well. You will pour the batter in the middle of the rings and will want to be able to lift the rings off when it is time to flip them to "finish them off". Traditionally Crumpets are not cooked well on the tops, but toasted golden brown on the bottom. They're simply shown the heat so they're not raw on top, then set aside to be served. So why did I go through this annoying recipe? The taste. Each time I made these, they turned out tasting like Sourdough bread. I truly love sourdough and while I can find it, it isn't exactly common. This recipe can be worked to add a little less liquid and make a bread dough. Needless to say, I'll be making Crumpet Bread out of the recipe because I like Sourdough so much. Ok, so the short of it... here are the ingredients. Original recipe is at Delia Smith's website. 8 oz or 225 g or "strong plain flour"
Mix flour and salt in bowl and set aside. To quart sized bowl or Ball Jar add milk, water, and sugar. You can substitute all milk for a bolder taste. Warm Milk to "hand hot" or 110F. Add yeast to milk/sugar mix and stir well. Cover liquids with a tea towel and set aside for 15 minutes or until frothy. Mix Liquids and flour/salt together until smooth batter is created - you may have to add extra milk one ounce at a time to get the desired consistency. Cover the bowl with that tea towel for 45 minutes and set aside in a warm place to rise. Heat griddle or skillet to 325. Grease griddle and Egg Rings/Crumpet Rings well. Pour batter into Egg Rings and cook until the bottoms are golden brown. Remove Egg Rings and then flip the Crumpets until the tops are cooked to the desired "doneness". Traditionally they are only very lightly cooked, you may like them crispy on top. I did. Re-grease your Egg Rings and repeat until you are done.